Whether you need help quitting smoking or services to help friends or family quit, or you simply need ideas on how to talk to your kids about smoking, we're here to help. Explore the resources below. New York State Smokers' QuitLine is a free and confidential service, providing effective services to New York State residents who want to stop tobacco use. This includes motivational coaching, free nicotine patches, an online smoke-free community, educational fact sheets, materials and videos. Additional educational tools and cessation resources for healthcare providers, employers, educators and others are also available at NYSmokeFree.com. Direct conversation. 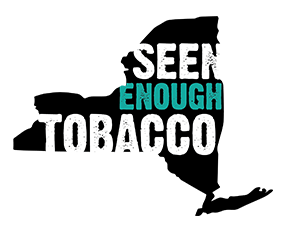 It is important to have a dialogue about tobacco usage with your children at age 5 or 6 – and continue the conversation into their teens. Use time in the car, at the dinner table or even draw attention to no-smoking signs in public places to reinforce disapproval. Emphasize consequences. Tell kids how smoking can cause fatal diseases (cancer, heart disease, lung disease, emphysema and more) and have immediate effects like bad-smelling hair/clothing/breath and proneness to acne. You can also point out that smoking can negatively impact sports performance and athletic endurance. Be the example. Set a smoke-free policy at home and for friends/family around your children. If you are currently a smoker, try to never light up near your children, and explain to them that it was a mistake to start and how difficult it is to quit. 4. Discuss responses to friends. "I don't want my clothes to stink like smoke." "I'm trying to stay in shape for soccer." "I heard those make you sick." 5. Explain different forms of tobacco and smoking. Explain different forms of tobacco and smoking. Be sure to discuss that the many different types of "smoke-free" alternatives are all still dangerous. Electronic cigarettes (vaping, electric hookahs) still use nicotine and other chemicals that are harmful to health, and smokeless tobacco ("chew") contains nearly 30 cancer-causing chemicals and is highly addictive.